Whether you're hosting a backyard graduation, a wedding reception for 300, a corporate event or a city festival, securing the right items to compliment your tent can be half the battle. 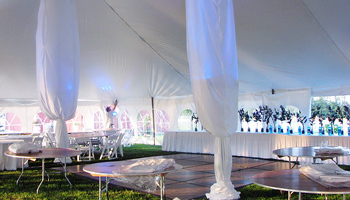 The more our Lansing tent rental company can supply you, the less worries you will have. So please take the time to consider these items and decide if they can help put the finishing touches on your party. 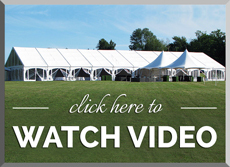 Our Michigan rental company has options on outdoor tents and most rental items to fit your needs and your budget. We have a wide variety of tables and chairs in various styles and sizes to handle all of your banquet and seating needs. Whether your banquet/seating requirements involve 10 or 10,000 people, American Rentals has one of the largest inventories of tables and chairs in the Midwest to handle all your needs. 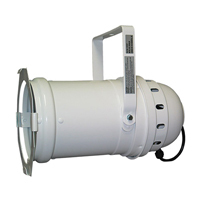 Our quality rental products come in a wide variety of sizes and styles to accommodate any situation. Let our staff with its many years of experience and knowledge help you plan and choose the products that are right for your event. To view a complete list of our wedding and party rentals, CLICK HERE. In Michigan, when the calendar goes to double digits the thermometer begins to drop. The availability of efficient portable heating equipment can extend your construction season or your event-planning season into the colder fall and winter months. Heating a tent for an outdoor event poses a different set of problems. The goal is to provide the warm air free of odor, operating at low noise levels, and for the equipment to be unseen by guests. To accomplish this we carry the only heater approved for tent use made by L.B. White®. The actual heating unit can be placed outside the tent and the air is ducted inside at key points to provide even heat throughout the tent. American Rentals has all the necessary accessories as well as those items that are often forgotten. Now that you have your tent picked out and handled your banquet and seating arrangements, its time to add the necessary trimmings to the package. 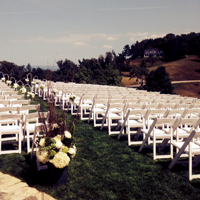 American Rentals has a variety of items to complete and compliment your event. Our AMERI-CAN portable toilets are the next most common item to accessorize your event. Whether to provide proper facilities at a remote location or to reduce traffic through your household, our clean and sanitary units will serve you well. With our large fleet of trucks and over twenty years of experience in the Michigan portable toilet market, we can promptly provide one to one hundred AMERI-CANS for your next event. 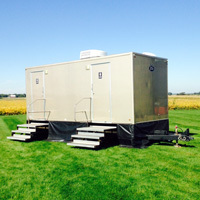 For the elegant and executive events, please ask about our ROYAL FLUSH toilet trailer. It comes complete with running water, flushable toilets, heating, and air conditioning. Read more about portable toilets and restroom rentals here. Our light-weight portable products and accessories can transform any existing facility into an attractive, unique, and functional setting for all special occasions. Please contact American Rentals to receive your free estimate, you'll be pleased with the results! If your job site is like most, you will find that your storage needs will fluctuate from day to day, week to week. Let American Rentals provide a quick and efficient solution to your space problems with one or more of our storage trailers. Storage trailers can be an economic and convenient way to house your valuable materials and tools providing protection from theft as well as from the weather. We have lengths, widths, and heights to fit most applications and are available with roll-up doors if the situation demands. With our experienced personnel and fleet of trucks , we can deliver a trailer right to your job site , usually within 48 hours. If your needs include office space as well, then you should inquire about our line of Wells Cargo office/storage trailers. These trailers offer the same convenient, economical, and efficient solution to your storage problem while also providing a temporary office area for your job site. All Wells Cargo office trailers are ready for electricity and some are available with heat and/or air conditioning. American Rentals wishes you the best of luck in planning your event, and will offer whatever assistance we can to help make it a success. Just give us a call toll-free at 1-800-637-1110 or request a free online estimate here.